I can give you four reasons why this is the perfect dessert recipe, it is ridiculously easy to make, it looks fabulous, each person gets their own little serving, and you can make it in advance. What more do you need?!? Oh yeah, and it is absolutely delicious! Okay, so there are five reasons why you must try this recipe. This has got to be one of the best dessert recipes I know and it only takes about five minutes to make. Not only is it incredibly quick and easy, but you probably already have the majority of the ingredients in your kitchen as well. This is perfect if you are looking for something rich and chocolaty. I think of this as a cross between grown up pudding and chocolate mousse. This recipe makes two large servings or four small. If you don’t have any individual dessert serving dishes try putting it in champagne or wine glasses for a fun twist. 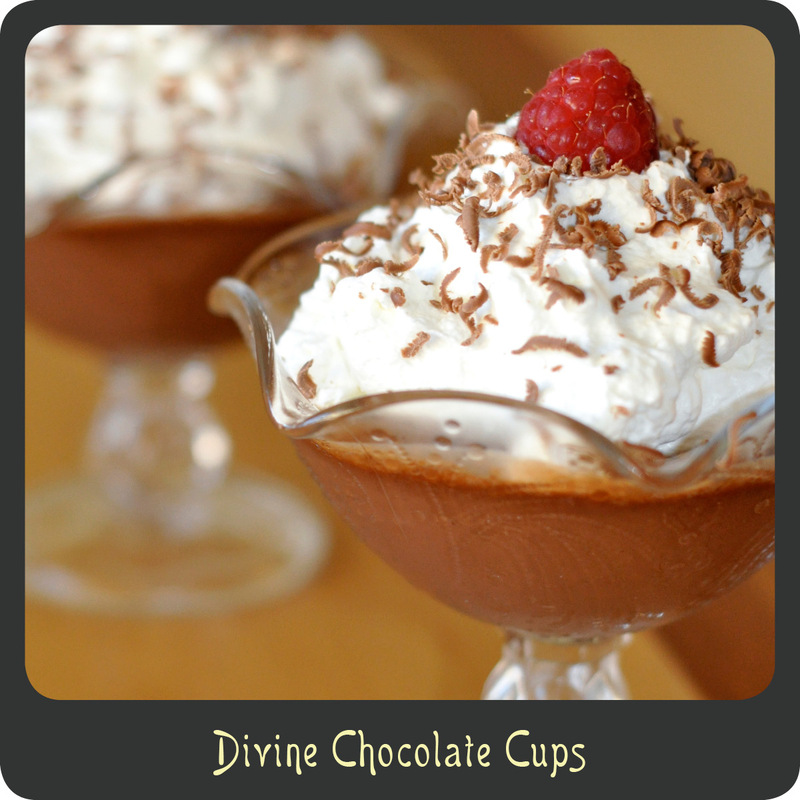 Note: Whip crème can be made at the same time as the chocolate cups and stored in the refrigerator covered until you are ready to enjoy or you can make it right before serving. In a blender combine egg, sugar, salt, chocolate chips, and liqueur. Blend using a low setting. Carefully pour in the hot milk in a slow stream. The hot milk melts the chocolate and cooks the egg. Blend mixture until smooth and creamy making sure there are no chocolate chips remaining, about 1 minute. Pour into your serving dishes. Place serving dishes in the fridge and allow to cool for a couple of hours. When ready to serve top with your whip crème and garnish with raspberries and chocolate shavings. Store in refrigerator until ready to use, or serve immediately if chocolate has already set.